Coachella weekend is one of the busiest and most hectic times of the year. Rachel Zoe knows we all need a little zen in our lives and has partnered with Guess Jeans to bring select guests just that. Zoeasis created yet another peaceful and gorgeous getaway this year; for vip guests to enjoy. Upon arrival guests were greeted with a private ride in a brand new Tesla to a private estate location encapsulated by beautiful scenery, music, and a specialty denim tent thanks to Guess Jeans. After a long day in the sun the PPLA’s team’s first stop was the bar to snag a champagne compliments of Freixenet. By far our favorite activation at Zoeasis was the addition of the Superga spin lab. Everyone was fitted for their perfect kicks followed by selecting your colors of choice and voila! Insert awesome shoe art on your sweet new custom shoes. It’s the DIY everyone has been needing in their life. 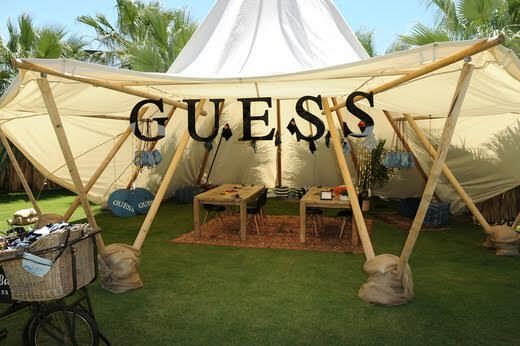 Guess had a fun denim bar where guests could select fun and playful patches and pins to add flair and personalized style to their festival gear. Our favorite goodie to take home was definitely our brand new sunnies compliments of Guess. Before heading out to the festival to watch the big bands perform that night we stopped by the Batiste Dry Shampoo Braid Bar to get our festival look picture perfect. A big thank you to Fresh cosmetics for including their ‘Sugar Sport Treatment’, we would’ve been redder than a field of strawberries without it. Make sure you load up plenty on the SPF if you’re getting ready to head out to Coachella for weekend 2.